The full-size Kawasaki KLX140G hits a sweet spot with adult beginner dirt bike riders who want enough power to climb hills and rail across rough terrain, but don't want to feel intimidated; they just want to have fun while learning how to ride. That's the beauty of the KLX140G - it's a full-size dirt bike for beginner adult riders that's loads of fun to ride, but still has enough power to be challenging. 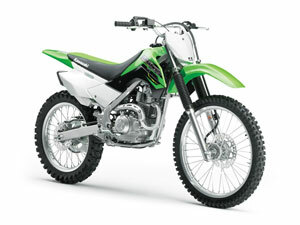 ** Note - to avoid confusion, Kawasaki has three beginner dirt bikes - the KLX140, the KLX140L and the KLX140G. You can find info on the first two bikes in our Beginner Dirt Bikes 125cc-140cc article. Normally it's helpful to compare two or more bikes but the KLX140G really doesn't have any close competitors - the other full-size beginner bikes are Yamaha's TT-R230, and Honda's CRF250F, but the differences between the three bikes were too numerous to do a full-on KLX140G vs. TT-R230 vs. CRF250F comparison, so the 140G is being reviewed on it's own, although some comparisons with the TT-R and CRF will be made. You can read more about the Yamaha and Honda comparison in our TT-R230 vs. CRF250F article. The Kawasaki KLX140G is powered by an air-cooled four-stroke engine, has a carburetor, a five-speed transmission, 21" front tire and 18" rear tire, along with both front and rear discs brakes. There's an electric start, but no backup kickstarter. The seat height is 33.9" which is very close to the seat height of the TT-R230 (34.3") or the CRF250F (34.8") so the KLX140G will fit a wide variety of riders. The 12.4" ground clearance of the 140G is over an inch more than the CRF250F (11.3) and .75" more than the TT-R230 (11.6) which allows for more aggressive riding without bottoming out the bike. The gas tank holds 1.5 gallons, and there's a six-month warranty with the option to extend the warranty at an additional cost. The one KLX140G spec not mentioned yet is the bike's weight, which is 218.2 pounds. That's only (on average) 20 pounds heavier than most of the small 125cc beginner bikes. On the flip side it's 32.8 pounds lighter than the TT-R230 (251 lbs. ), and 46.8 pounds lighter than the brand-new CRF250F (265 lbs. ), and that's a big plus for lighter weight riders who still need a full-size bike because of their height. When you crash (and you will crash) it's a lot easier picking up a 218 pound bike than a 265 pound bike, especially if you're in the 150-180 pound weight range. The MSRP of the KLX140G is $3699, which is $700 less than the 2019 TT-R and $900 less than the 2019 CRF250 although it does need to be noted that the Honda has fuel injection while the KLX140G has a carburetor. And yes, the 140G is 100cc's less than the CRF250F, but engine size is only one component of an overall bike. They both have wider ratio five-speed transmissions, and the 47 pound weight savings makes the 140G a solid contender. Kawasaki hit the nail square on the head with the KLX140G. Front and rear disc brakes, full-size wheels, lots of ground clearance and light weight all come together in an awesome package. The 140G is affordable, lightweight, dependable, and powerful without being intimidating which will give you the confidence to move up to an intermediate bike when the time comes. You can find more info about the KLX140G at the Kawasaki website. The first video is a guy riding a KLX140G that's 6'1" tall and weighs 225 pounds. The second video is an overview of the KLX140G from Transworld Motocross.